Join the world's first biking dixieland band! I'm putting together a dixieland band on wheels! All I've got so far is myself and my ridiculous idea - so I'm looking for some solid musicians who are also keen cyclists. We won't play while riding, but we should be able to carry all of our kit on bikes so we can participate in group rides, parades, and community events. This will be easier for some than others, but I will be riding my Christiania cargo trike, with plenty of room for an amp and some other unwieldy equipment. I anticipate that most of our summer performances will be at outdoor events relating to cycling in some way, but as we progress musically, we may also take on gigs without the bikes. I'd like to start rehearsing in February so we're ready to go this Spring. Apart from playing great traditional dixieland music, the band (which still needs a clever and catchy name), will also be about cycling advocacy. So it's important for all of us to be passionate about the music and about cycling. I live and work in Arlington, and I expect that most rehearsals will be in the same general area. I'm sure there are lots of questions I haven't thought about yet, and I'm looking forward to sorting them out as a group. Are you interested? If so, please email me at ahconway@gmail.com and tell me about your music and your cycling - and any other genius ideas you have for making this band work! About me: I've been active in cycling advocacy in New York, London, and Boston since 1990. I can be spotted around Arlington doing the school run with my two daughters on the Christiania most days (when the weather cooperates). I play tenor trombone with the Chelmsford Community Concert and Jazz Bands, and other gigs as they come up. Today was one of the coldest mornings of the year, 12 degrees or so without chill factor. Elsie has school today (which she was very excited about: pajama day!) Kim had an early meeting in Boston and took all our car keys with her so I biking with them was really the only option available. Fortunately, while crazily cold, the weather was very clear and the road surfaces were clear. So I bundled up both of them in a few layers and two blankets and set off down the hill to Elsa's school. Since I'd also bundled myself up pretty well, we arrived in good shape, everyone chipper and ready for the day! Even the unicorn. The ride home was a bit tough - my lungs suffered a bit when breathing hard, but I took it easy, walking up the steepest bits. Then Gem and I had a lazy morning doing crafts and unpacking from our holiday trip to NYC. And then, of course, I found the spare car key! I'm not big on resolutions, but why not? There's definitely a handful of things I want to make sure to get done next year - if I resolve to do just that, looks like I've got a list of resolutions. Here goes, no particular order. Get a snazzy lightweight road bike. If I learned anything about myself as a cyclist this year, it's that I have loads of fun and can go 25% faster on a sporty bike than on my trusty expedition tourer. The budget will be a challenge for sure. But my devotion to steel will probably work in my favor here. I could end up with a nice vintage Colnago or a new bike built around a Soma Stanyan or Thorn Audax Mk3 (which would match my Raven exactly, unless I go with the red finish). As long as I don't need the latest carbon fiber frooferie and refuse to ride aluminium, I have lots of options on a budget. Another nice option is the Fratello from Condor Cycles in London - I ADORE the yellow one and the champagne one - set it up with a nice brown Brooks B17 and brown leather bar tape and it's a time machine back to 1978. Do some overnight touring. Even if it's just credit card touring, I ought to be able to spare a couple days to spend on the road for a bit of adventure! I may even be able to mate this up with the old D2R2 or our summer trip to the Berkshires. Get out on the road with the family. 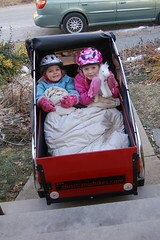 We had some nice family rides this year, but Kim didn't have much time for riding. Hopefully, she'll be able to work it into her commute. Gemma's all for the trail-a-bike, but she should start riding on her own this summer. Elsa should be ready for the trail-a-bike when Gem graduates. This is just the personal and family stuff. Of course, it's great that many of my worky resolutions are also bike-related! But I'll leave those alone for now. Overall, I managed to get into really great shape this summer, pretty early on. One reason I was able to do this was getting out on longer organized rides - I intend to do the same this year without question.